A rough estimate price for a fursuit from us. The detailed description for our typical Fursuit design. Please note that these are not final prices - the price may change depending on the circumstances. Please contact us any way you want for a specific evaluation of the work. - soft teeth from fleece. If you take the responsibility to supply the fur to us (we will discuss the length of fur for your character), then the cost of the fursuit will be $ 1500. At the same time, the cost of fur is about $ 250 and delivery is about $ 100, so there is some benefit in this for you. The offer is valid only for full fursuit. $800 Partial Suit — head, handpaws and feetpaws, tail. $1500 Body only. It includes: body, handpaws and feetpaws with sandals for outdoor, tail. + $100 Large amount of hair besides the fur (big mohawk, mane, etc). + $150 If big wings, complex. + $150 Complex shapes or Very large tail (otter, dragon, Sergal, Crux etc). + $150 Rare colors for fur or very dense and high-quality fur (is a long an order through ebay; Possible delivery fur by the customers, with deduction of the cost of delivery from fursuit making) + $70 A lot of complex markings (excessive spots, swirlies, stripes, anything that isn't simple solid colors). OUR FURSUIT'S DESIGN HAVE MULTI-SIZE. AND WE DON'T NEED A SCOTCH DOLL TO “GUESS” THE SIZE OF A FURSUITER. 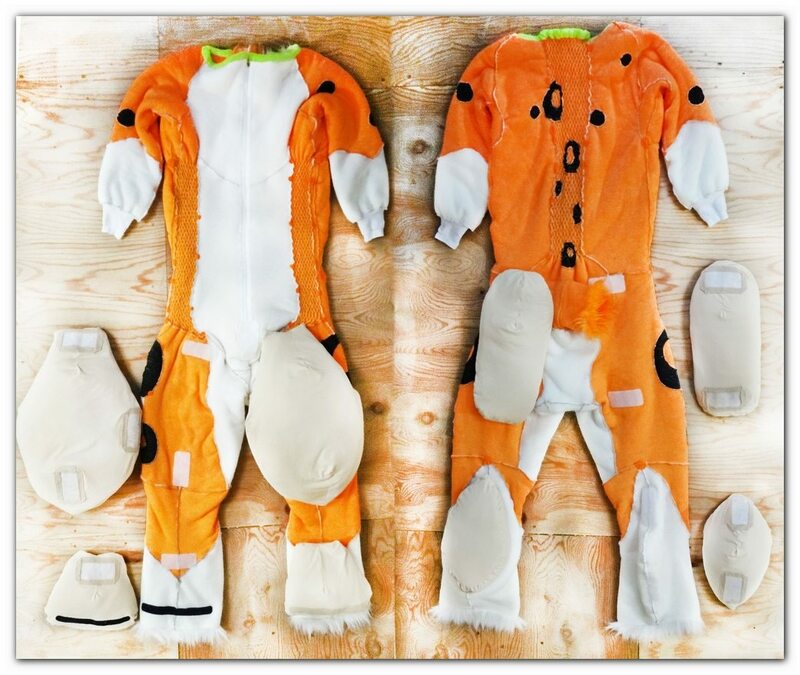 The fursuit's overalls have a large stock in size and tied by textile elastic bands. Thus, it fits on a body as tight glove and at the same time it does not himself exert excessive load when worn. The collar of overalls is hemmed with fleece for reliability. Multi-size fursuit makes it easier to sell it, if you don’t need it anymore. 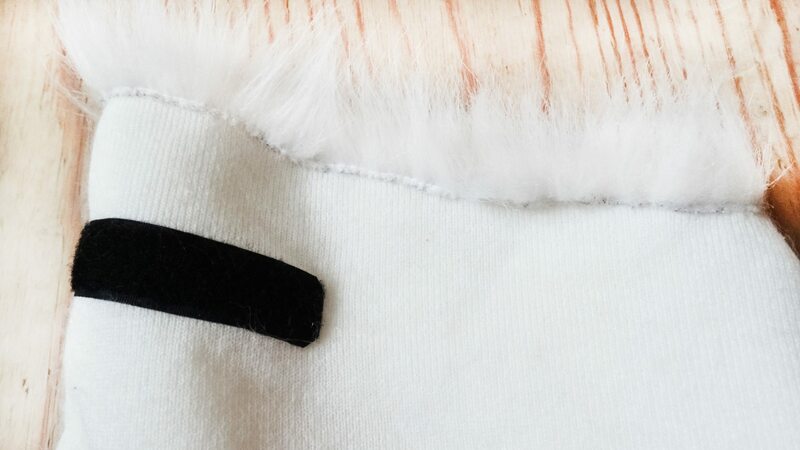 All the fur's free edges are hemmed and do not stick out. 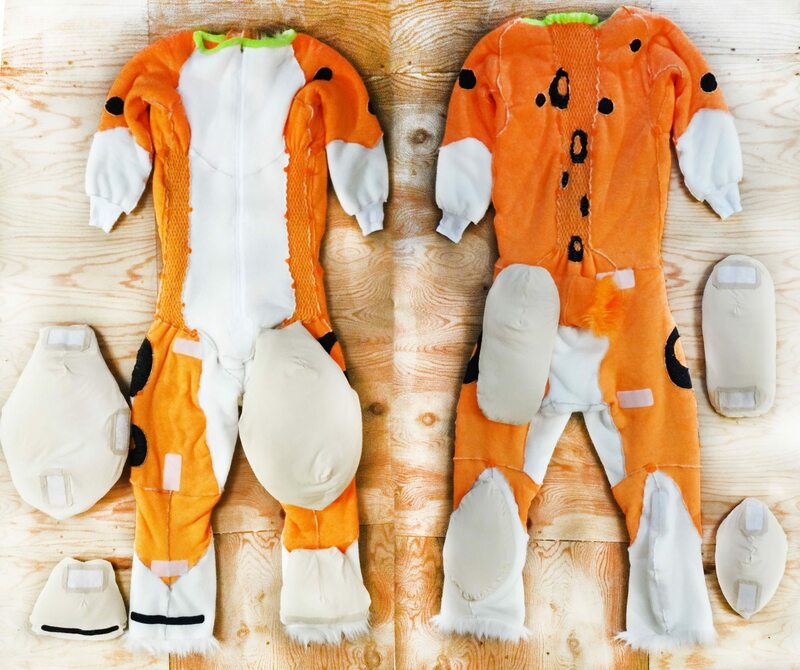 The shape of full digitigrade's character is set by pads, filled by a synthetic winterizer. Pads are removable by Velcro, they can be washed separately, they are much lighter than pads from foam rubber, they are perfectly compressed during storage and transportation. 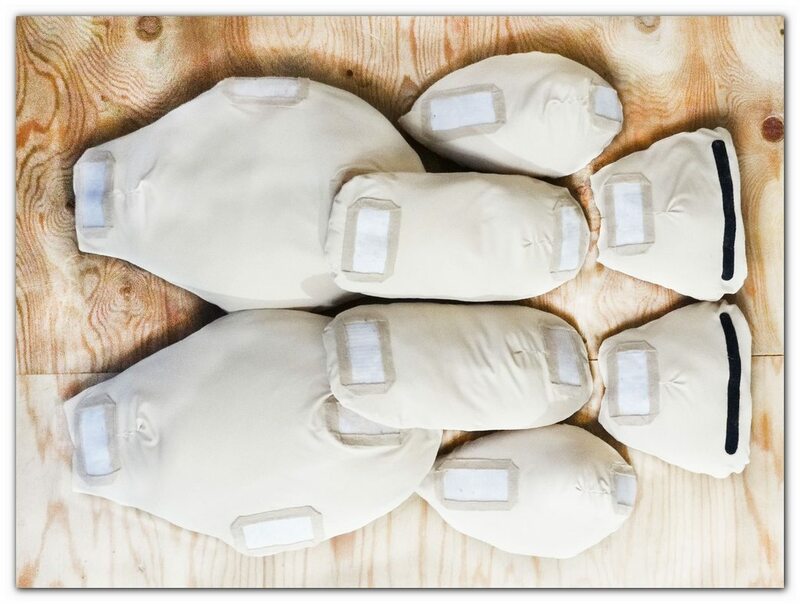 The head is made of ½ inch polyethylene foam with a steel wire frame (see the section of the site about assembling our fursuits). In contrast to the mask from foam, our design has a smaller area of contact with the head of the fursuiter - it is less hot inside. The ears of the mask have a large ventilation's vents. The eyes are made of thick white plastic. Drawn with acrylic (mask can be washed). For greater light reflection of the orbit inside pasted over by white fleece. The eye's eру rims are pre-plastered by black fleece. The jaw is opens and can be removed. This is useful for quick drying and cleaning the mask from the inside. The fursuit's head consists of several parts with pads, which allowing it to have a multi-dimension. A tongues are made removable on Velcro. The mask has separate front and rear aprons with cormans sewn to them. The nose is trimmed with fleece with nostril imitation inserts. 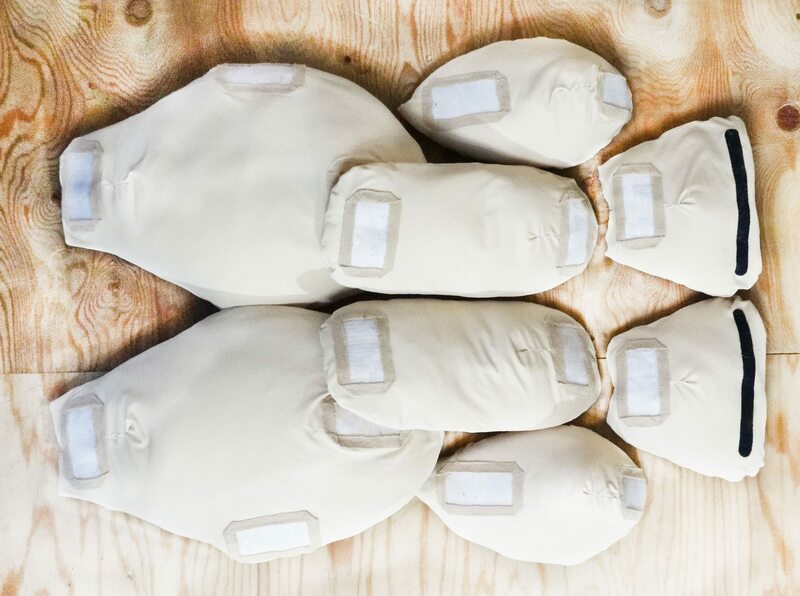 The nose can have an edging from fleece and can be made of any size and shape. The muzzle may have fleece spots - imitation of whiskers. May have a mustaches made of thick fishing line can be made (see our tigers). The teeth are made from white fleece and not removable. Lips made from fleece. 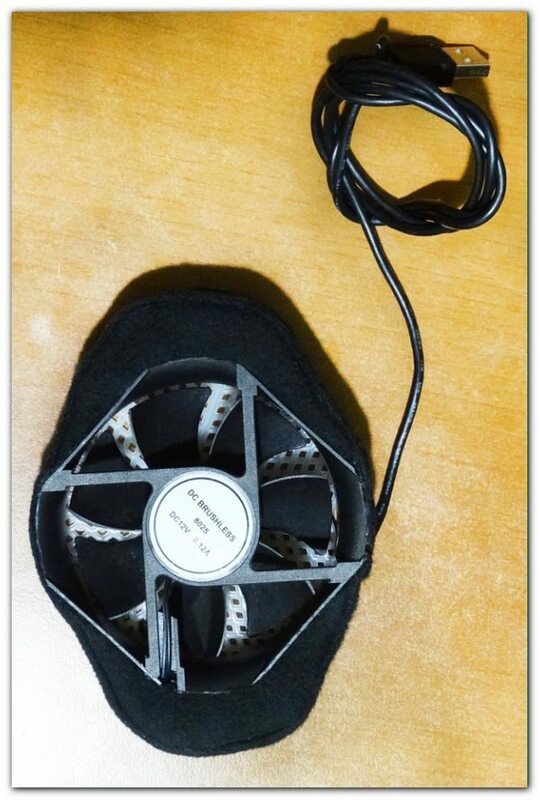 A large 3" fan is removable and can move in the mouth to select its comfortable position. The mouth with the fan installed is always slightly open. A tail of a demountable design with fastening from a strong tape for a usual belt. 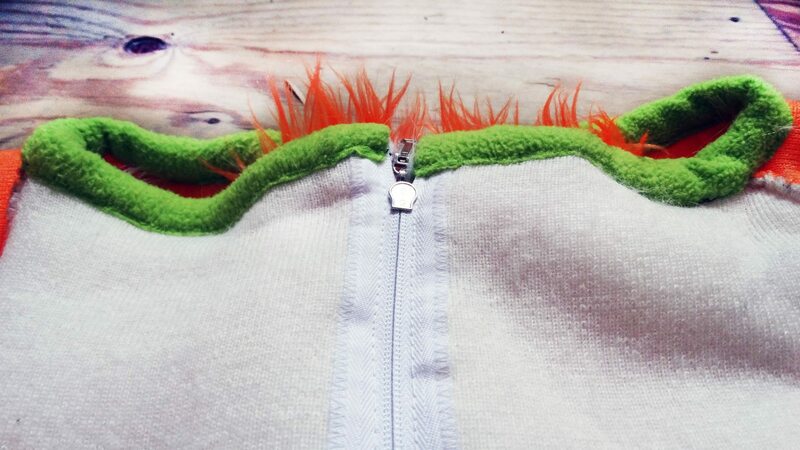 For the tail in the overalls is made a “sleeve” from fur, so that the tail does not look like a separate, hanging piece. 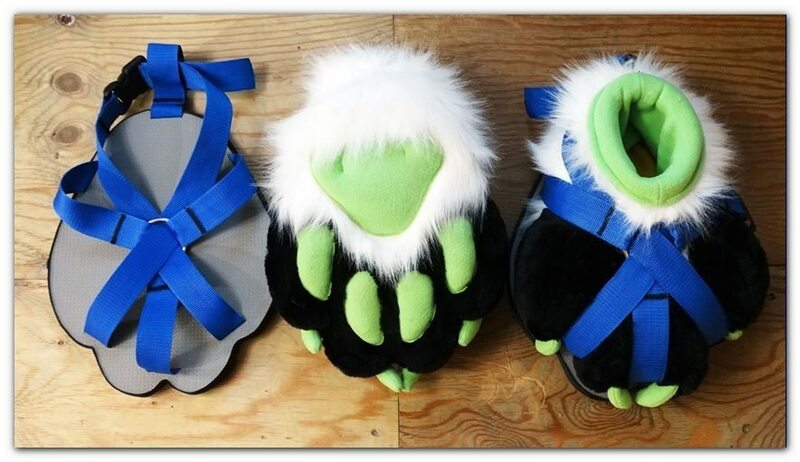 Finished paws have soft voluminous fleece pads and can be equipped with sandals or just have a rubber sole. Depending on the character, the paws may have soft claws made from fleece. Inside the paws there is a fleece sock, which can be turned out for quick drying or cleaning. 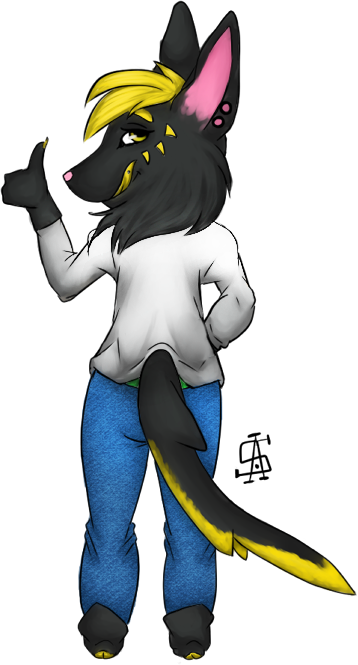 Feetpaws are multy-size. Inside there is no have boots of a certain size. The base is made of foam rubber. 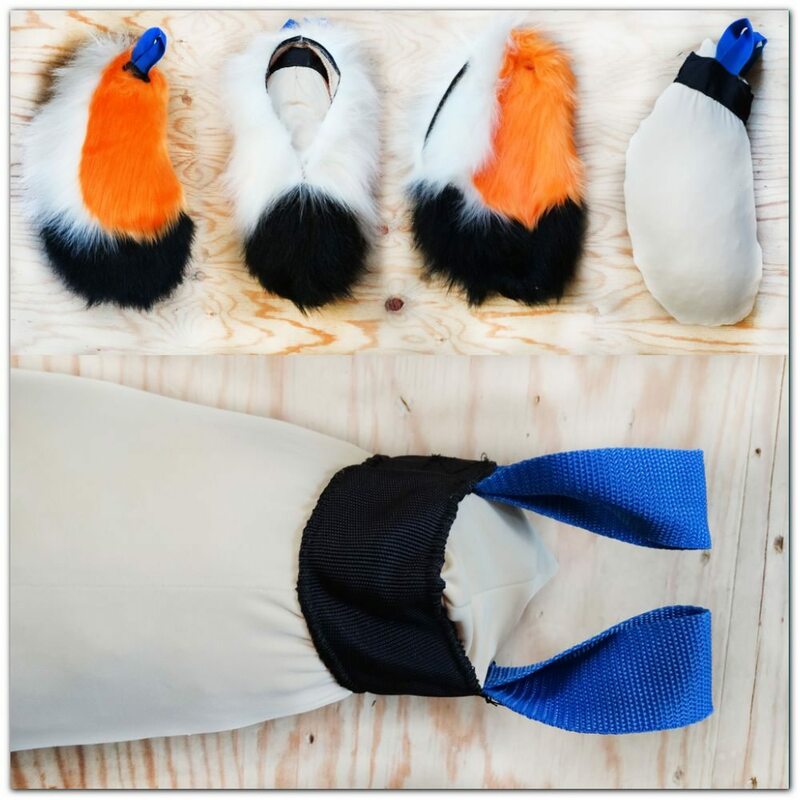 For comfort a feetpaws contain a heel and side restraints and have very light in weight. 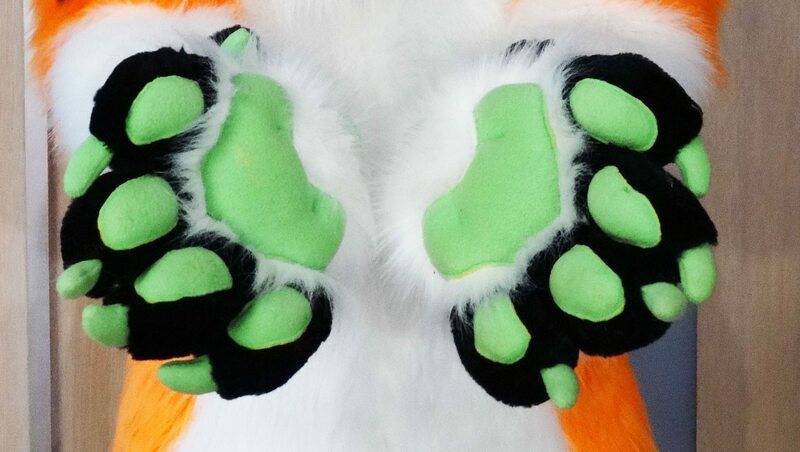 Handpaws will always be made with voluminous pads and claws made from fleece. It is possible to make a 5-fingered. By default we will be made paws with 4-fingered with false "5 finger". finger. Send us your details and we'll get in touch withtin 24 hours (possible except weekends). Hi! We are furagency - a creative fursuits agency! This includes all content and original design work, including the distinctive typographic style, layout and composition of this website.